Yesterday we looked at a perfect project using Couture Jazz yarn, a jumbo yarn, making the Basketweave Pillow. 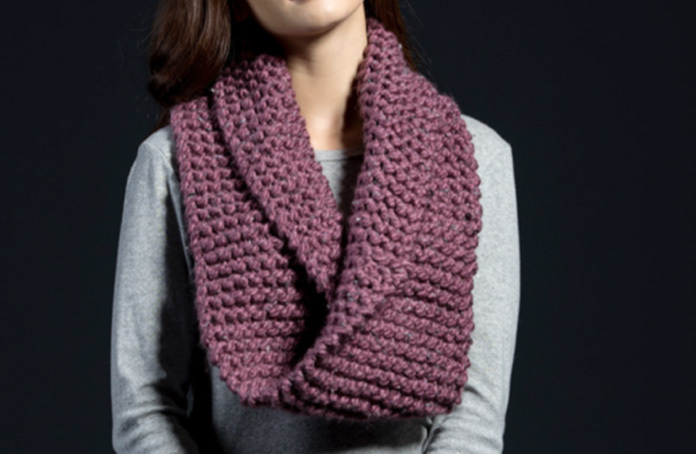 This make a very quick pattern to knit up just in time for the holidays, and gifts in general. Imagine making this for someone and tailoring the color to their home decor! Priceless and effortless!!! Today I’m taking a look at the Mobius Cowl pattern by Premier Yarns, originally created for a different yarn. It’s not quite as thick as Couture Jazz, but the pattern is in garter stitch, so it’s easily adjustable. While the pattern is a plain stitch, the beauty of making it in Couture Jazz is the size of the stitches and the lovely brushed halo. 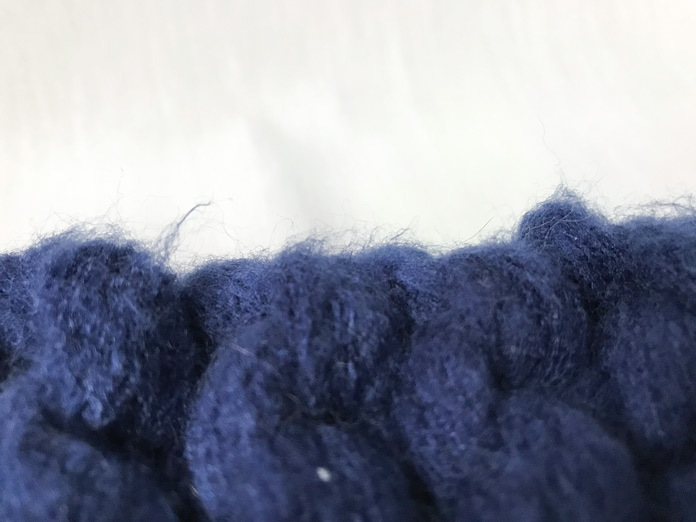 You can really see the whisps of fiber coming off the yarn. It gives your finished object an inviting plush glow. As I mentioned earlier, the Mobius Cowl is written for a little bit of a finer yarn, so I cut down the stitches from 16 to 10. I just cast on 10 stitches and I got the same width as the other yarn with 16 stitches. The pattern states to knit until the cowl is 38”, but with the thickness of the yarn, 38” didn’t feel like enough. I thought the cowl would have been stiff and weird, so I kept knitting. I wanted it to have some amount of drape. At 42”, and 5 balls of yarn, the cowl felt like it would have sufficient weight to stay put while being worn. When I was sewing the ends together, I started by fully binding off. I didn’t try to do any kind of Kitchener stitch situation, although in hindsight I could’ve. The yarn was very thick, so I didn’t try to use any kind of darning needle. First of all, I didn’t have one big enough; second of all, your fingers work just fine for that. You’re actually able to get in between the stitches with your fingers and seam the ends together that way. Easy, peasy, no fuss at all! You can definitely see where I stitched the two ends together, but it doesn’t stand right out. It’s something you notice if you’re looking for it. This pattern is the epitome of potato chip knitting, you cannot do just one. The whole cowl only took an hour and a half. 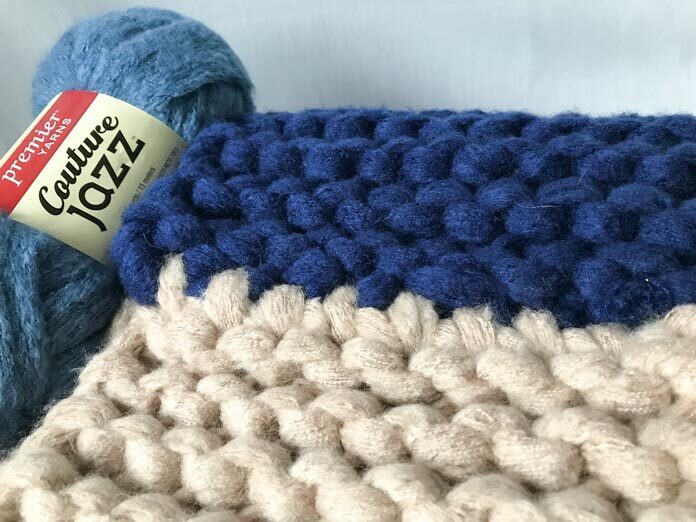 It’s the perfect pattern for Christmas, and check out Couture Jazz sparkle to add a little festivity to your holiday knitting.